My violin and my confusion on whether the flame is real or not. Typically this wouldn't be an issue for me to tell...well now it is. My unlabeled violin has a one piece flamed back and ribs...but I can't tell if it's real or not. When I move the violin in different positions, the color of certain parts of the instrument change color and such. The flame seems to be real...but when I look inside the instrument...all I can see are the grains of the wood going vertically and some crosshatches. It's hard to xplain but under certain lights I can see dark stripes where the flame on the back is...I'm ore curious han anything despite my fear of the answer being it is fake flame. I believe they are real. Thank you! I wasn't exactly sure since looking at the flame on the back of my viola and then through the f hole it was more prominent to be seen. While on my violin, certain angles with the light would reveal some dark lines where the flame would be seen, so I wasn't entirely sure. Varnish brings out the flames. I would be more certain if I could see the instrument in person of course. I could perhaps ask my violin teacher since we won't be paying another visit to my luthier anytime soon. I may also be able to get a picture inside the instrument, but like I had said, I can really only see the grains of the wood with some spots of flame inside, so I am a bit baffled. There are also a bunch of black spots inside the violin on the ribs, so that inhibits me from really seeing the flame on the ribs, so I can't determine that there. I truthfully do not know who has been spilling things inside my instrument, but I have spots of different color in there and have no clue where they come from. Also, thank you for the reply! I will try to post a picture of the inside today at some point! I can see some light lines that I'm assuming is part of the flame. I'm not entirely sure. I also think it's real, but that is just my impression. I am no expert, but since the color changes under the light when you move the instrument, there are some serious odds that it's the pattern of the wood, and not something fake. And even if it was fake, it would take a lot of time and effort, to achieve such a result I guess...so if this is the worst case scenario, then it would be a job of a master hehe. Also, I get the impression that in the pic you posted looking through the f hole, maybe the wood pattern matches what we see in the instrument's back. It's not that apparent of course, but as Fiddlerman said, the varnishing process brings out the flame. 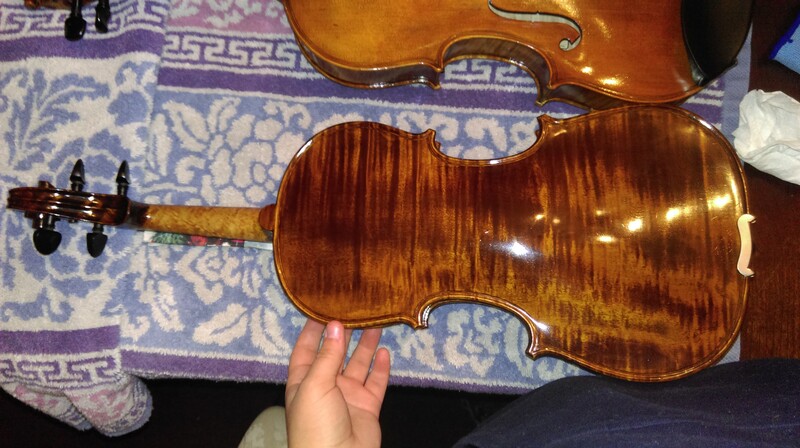 I was actually told my violin was factory made - where all the parts were handed down a line of people. And honestly, all those curious black spots and spills inside the instrument remain a mystery. As you saw, there was no label and this violin was bought used so I can't confirm it's age. I know for a fact it is over 7 years old though. As for the neck, it is unique but when you look close at the neck of the instrument, the flame is there on one side of the instrument. It seems that from when we bought this instrument, the man who previously owned it shifted a lot (and played in general, the second bow we had from this guy had no life in it) and the flame seems to have actually been rubbed around. When I say "flame" I mean the finish on it. It's kind of weird but I can't deny that I do infact like it. Then on one last note...Funny you mention the chip on your instrument. Just recently (maybe a week ago, I haven't been able to play for awhile) I noticed that underneath the scroll where the top end of the peg-box is...a small chunk of the peg-box has actually started chipping off. I have no clue how such a weird injury could happen in such an awkward spot but I am not the happiest child and feel that urging need to get it fixed, despite it having no affects on the sound of the instrument. I am not sure if I get this right. 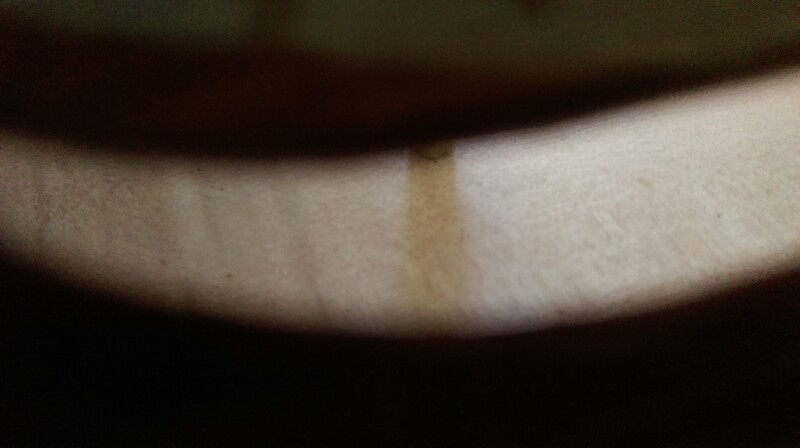 However, if this happened near the small "gap" between the scroll and the rest of the head, and not inside the pegbox, my guess is that at first it is a very small space for the maker to work, so imperfections could exist in some instruments...I have also seen some luthiers hang violins from the scroll. You could find some pics online about this method, so if the chip is there, it could be, you know, "natural" or expected. Yes, that is what I meant but I wasn't exactly sure how to explain it but I know for a fact my violin has not been hung...in maybe...years? This is brand new and I literally am so careful with my instruments. It is a bit of an odd spot so when I noticed it I was a bit shocked and confused. The luthier I go to hangs his instruments and I don't see much wrong with it unless if they sit there for ages on end without being taken off. That's the only thing I really hate about hanging them. I think that overall it's a difficult part of the violin to work...This could lead to slight imperfections in the carving, and in the varnishing, and you know..after years part of the varnish could just chip, if something went somehow wrong at the first place. Flame won't show very well when the wood is unfinished. I have helped select bare book-matched maple for Gibson Les Paul guitar tops. In order to get some idea what the wood will look like after it is lacquered we sprayed a mist of naptha on it. That showed up the flame or birdseye and grain but it didn't effect the wood after it quickly evaporated. I'll bet violin makers do the same thing. Incidentally, that is a gorgeous back. Very true. Varnish, or oil brings forth the flames and the beauty of the wood.